Free and open source, Git is a distributed version control system that makes collaborative software projects more manageable. Many projects maintain their files in a Git repository, and sites like GitHub have made sharing and contributing to code simple, valuable, and effective. Open-source projects that are hosted in public repositories benefit from contributions made by the broader developer community through pull requests, which request that a project accept changes you have made to its code repository. This tutorial will guide you through making a pull request to a Git repository through the command line so that you can contribute to open-source software projects. You should have Git installed on your local machine. You can check if Git is installed on your computer and go through the installation process for your operating system by following this guide. You’ll also need to have or create a GitHub account. You can do so through the GitHub website, github.com, and can either log in or create your account. Finally, you should identify an open-source software project to contribute to. You can become more familiar with open-source projects by reading through this introduction. A repository, or repo for short, is essentially the main folder of a project. The repository contains all the relevant project files, including documentation, and also stores the revision history for each file. On GitHub, repositories can have multiple collaborators and can either be public or private. In order to work on an open-source project, you will first need to make your own copy of the repository. To do this, you should fork the repository and then clone it so that you have a local working copy. You can fork a repository on GitHub by navigating with your browser to the GitHub URL of the open-source project you would like to contribute to. 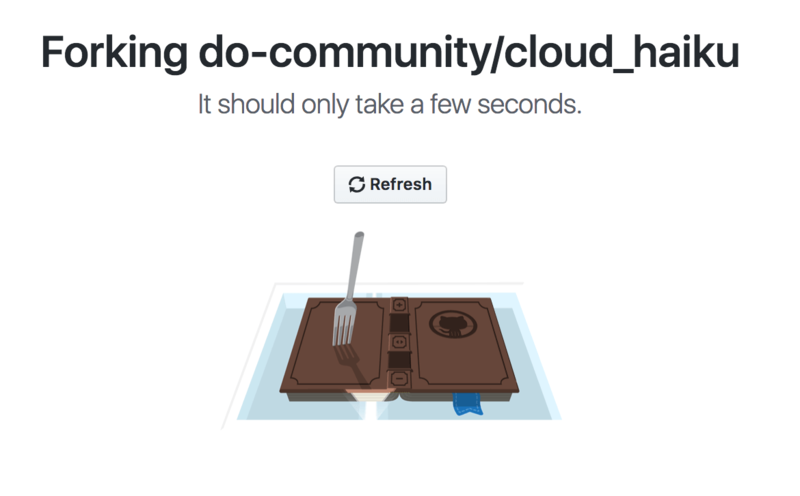 In the above example, do-community is the username and cloud_haiku is the repository name. Or you can search for the project using the GitHub search bar. Once the process is done, your browser will go to a screen similar to the repository image above, except that at the top you will see your username before the repository name, and in the URL it will also say your username before the repository name. With the repository forked, you’re ready to clone it so that you have a local working copy of the code base. To make your own local copy of the repository you would like to contribute to, let’s first open up a terminal window. 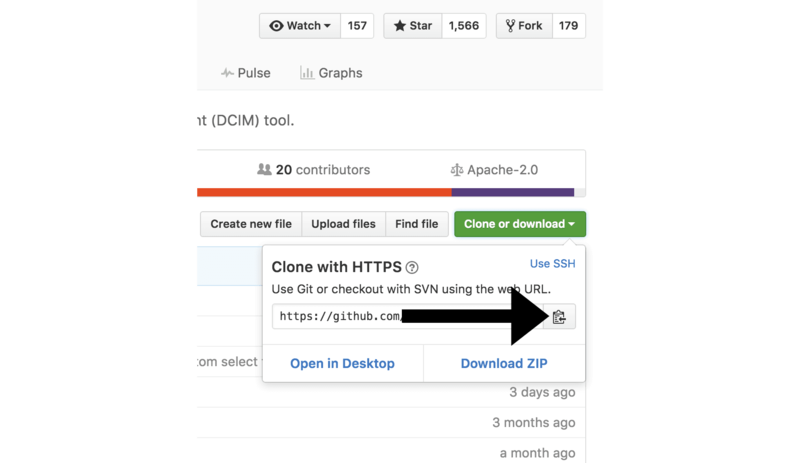 We’ll use the git clone command along with the URL that points to your fork of the repository. Now that we have a local copy of the code, we can move on to creating a new branch on which to work with the code. Whenever you work on a collaborative project, you and other programmers contributing to the repository will have different ideas for new features or fixes at once. Some of these new features will not take significant time to implement, but some of them will be ongoing. Because of this, it is important to branch the repository so that you are able to manage the workflow, isolate your code, and control what features make it back to the main branch of the project repository. The default main branch of a project repository is usually called the master branch. A common best practice is to consider anything on the master branch as being deployable for others to use at any time. When creating a branch, it is very important that you create your new branch off of the master branch. You should also make sure that your branch name is a descriptive one. Rather than calling it my-branch, you should go with frontend-hook-migration or fix-documentation-typos instead. To create our branch, from our terminal window, let’s change our directory so that we are working in the directory of the repository. Be sure to use the actual name of the repository (such as cloud_haiku) to change into that directory. Now, we’ll create our new branch with the git branch command. Make sure you name it descriptively so that others working on the project understand what you are working on. The checkout command will allow you to switch between multiple branches, so you can potentially work on multiple features at once. At this point, you can now modify existing files or add new files to the project on your own branch. Next, we’ll want to record the changes that we made to the repository with the git commit command. The commit message is an important aspect of your code contribution; it helps the other contributors fully understand the change you have made, why you made it, and how significant it is. Additionally, commit messages provide a historical record of the changes for the project at large, helping future contributors along the way. git commit -m "Fixed documentation typos"
Underneath the introductory comments, you should add the commit message to the text file. To write a useful commit message, you should include a summary on the first line that is around 50 characters long. Under this, and broken up into digestible sections, you should include a description that states the reason you made this change, how the code works, and additional information that will contextualize and clarify it for others to review the work when merging it. Try to be as helpful and proactive as possible to ensure that those maintaining the project are able to fully understand your contribution. Your branch is ahead of 'origin/new-branch' by 1 commit. Branch new-branch set up to track remote branch new-branch  from origin. You can now navigate to the forked repository on your GitHub webpage and toggle to the branch you just pushed to see the changes you have made in-browser. At this point, it is possible to make a pull request to the original repository, but if you have not already done so, you’ll want to make sure that your local repository is up-to-date with the upstream repository. While you are working on a project alongside other contributors, it is important for you to keep your local repository up-to-date with the project as you don’t want to make a pull request for code that will cause conflicts. To keep your local copy of the code base updated, you’ll need to sync changes. We’ll first go over configuring a remote for the fork, then syncing the fork. Remote repositories make it possible for you to collaborate with others on a Git project. Each remote repository is a version of the project that is hosted on the Internet or a network you have access to. Each remote repository should be accessible to you as either read-only or read-write, depending on your user privileges. In order to be able to sync changes you make in a fork with the original repository you’re working with, you need to configure a remote that references the upstream repository. You should set up the remote to the upstream repository only once. Let’s first check which remote servers you have configured. The git remote command will list whatever remote repository you have already specified, so if you cloned your repository as we did above, you’ll at least see the origin repository, which is the default name given by Git for the cloned directory. If you have previously set up more than one remote, the git remote -v command will provide a list of all of them. Next, we’ll specify a new remote upstream repository for us to sync with the fork. This will be the original repository that we forked from. We’ll do this with the git remote add command. In this example, upstream is the shortname we have supplied for the remote repository since in terms of Git, “upstream” refers to the repository that we cloned from. If we want to add a remote pointer to the repository of a collaborator, we may want to provide that collaborator’s username or a shortened nickname for the shortname. Now you can refer to upstream on the command line instead of writing the entire URL, and you are ready to sync your fork with the original repository. Once we have configured a remote that references the upstream and original repository on GitHub, we are ready to sync our fork of the repository to keep it up-to-date. Now, commits to the master branch will be stored in a local branch called upstream/master. The output here will vary, but it will begin with Updating if changes have been made, or Already up-to-date. if no changes have been made since you forked the repository. Your fork's master branch is now in sync with the upstream repository, and any local changes you made were not lost. Depending on your own workflow and the amount of time you spend on making changes, you can sync your fork with the upstream code of the original repository as many times as it makes sense for you. But you should certainly sync your fork right before making a pull request to make sure you don’t contribute conflicting code. At this point, you are ready to make a pull request to the original repository. You should navigate to your forked repository, and press the “New pull request” button on your left-hand side of the page. You can modify the branch on the next screen. On either site you can select the appropriate repository from the drop-down menu and the appropriate branch. 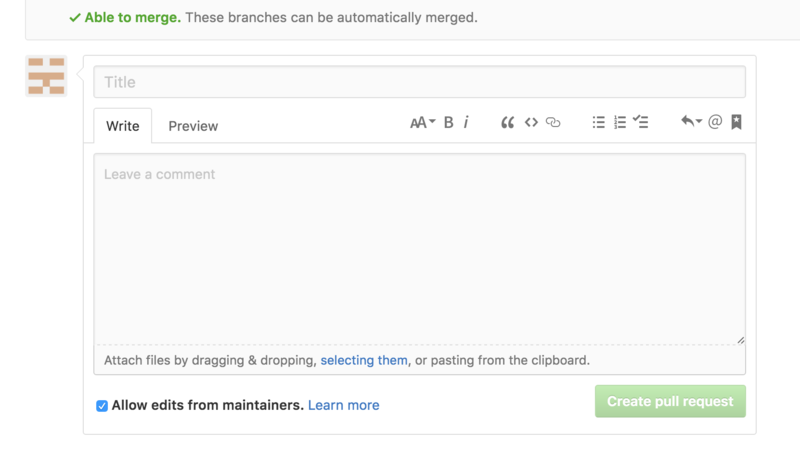 GitHub will alert you that you are able to merge the two branches because there is no competing code. You should add in a title, a comment, and then press the “Create pull request” button. At this point, the maintainers of the original repository will decide whether or not to accept your pull request. They may ask for you to edit or revise your code prior to accepting the pull request. At this point, you have successfully sent a pull request to an open-source software repository. Following this, you should make sure to update and rebase your code while you are waiting to have it reviewed. Project maintainers may ask for you to rework your code, so you should be prepared to do so. Contributing to open-source projects — and becoming an active open-source developer — can be a rewarding experience. Making regular contributions to software you frequently use allows you to make sure that that software is as valuable to other end users as it can be. Open-source projects that are hosted in public repositories benefit from contributions made by the broader developer community, and are typically managed through Git. This tutorial series will guide you through selecting an open-source project to contribute to, making a pull request to a Git repository through the command line, and taking steps to follow up on your pull request. Open-source projects that are hosted in public repositories benefit from contributions made by the broader developer community, and are typically managed through Git. This tutorial will discuss the benefits of contributing to open-source projects, and go over installing and setting up Git so that you can contribute to software projects. This tutorial will guide you through some of the next steps you may need to take after you submit a pull request to an open-source software project. This tutorial will take you through some tips for maintaining public repositories of open-source software. Being a leader of an open-source project comes with both technical and non-technical responsibilities to help foster a user-base and community around your project. Taking on the role of a maintainer is an opportunity to learn from others, get experience with project management, and watch your project grow and change as your users become invested contributors. This cheat sheet-style guide provides a quick reference to some of the more common Git commands you may use when managing repositories and collaborating on software.